China is denying a report by a U.S. cybersecurity firm that concluded Chinese hackers likely meddled in Taiwan’s midterm elections in which pro-China candidates overwhelmed the party of pro-U.S. President Tsai Ing-wen. “Taiwan has always been a primary target of malicious cyber operations, especially from actors aligned with the People’s Republic of China,” Fred Plan, senior analyst at FireEye, told the Nikkei Asian Review. “I’d be very surprised if China wasn’t doing that” in the midterm elections on Nov. 24. 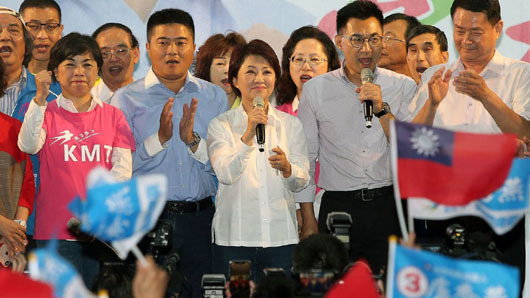 Taiwanese President Tsai Ing-wen’s ruling Democratic Progressive Party (DPP) saw its share of the 22 cities and counties on the island nation drop from 18 to 6, seen as a major blow to her prospects for re-election in 2020. Hours after polls closed, Tsai resigned as the DPP’s chairwoman and her premier offered to quit. The biggest shock, observers say, was the sudden swing in the DPP’s southern stronghold of Kaohsiung to little-known pro-China Kuomintang (KMT) candidate Han Kuo-yu. KMT Party Chairman Wu Den-yih said his camp would keep advocating for stronger relations with Beijing based on the one-China prerequisite for dialogue. “We hope the two sides will soon go back to a peaceful and stable trend in relations,” he told reporters. Before the elections, Tsai and her administration had suggested that China had interfered during the campaign. A week before the vote, China’s Taiwan Affairs Office spokesman Ma Xiaoquang denied the allegations. FireEye’s Plan said China has a proven track record of interfering in the democratic systems of countries where it has economic interests, citing Cambodia’s recent election, where he said China was clearly behind moves to keep pro-Beijing leader Hun Sen in office. Plan said cyber offensives could be expected in a number of Asian countries with elections coming up, including the Philippines, Thailand, India, Australia and Indonesia.